THE COMMONWEALTH of Massachusetts has a population of 6,379,304 (2001), more than half of whom live in the greater Boston metropolitan area. The largest city in the state is Boston (the capital), with a population of 589,141, and the smallest town is Gosnold, with a population of 86. 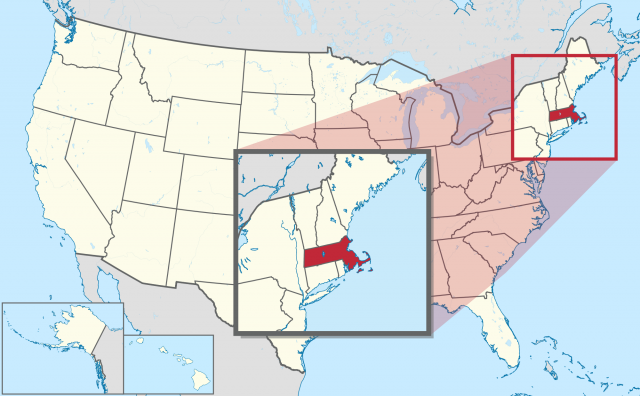 It borders NEW HAMPSHIRE and VERMONT to the north, NEW YORK to the west, and CONNECTICUT and RHODE ISLAND to the south. Massachusetts has an area of 10, 555 square mi (27,337 square km) and its highest point is Mount Greylock, at 3,487 ft (1,062 m). The lowest point is sea level or 0 ft.
Massachusetts has a widely varying topography, containing beaches, rocky shores and salt marshes along the coast and rolling and wooded hills throughout the central and western parts of the state. The state itself can be divided into six separate land regions: the coastal lowland, the Eastern New England Upland, the Connecticut Valley Lowland, the Western New England Upland, the Berkshire Valley, and the Taconic Mountains. The coastal lowlands comprise the coastal lands along the ATLANTIC OCEAN, including low hills, swamp land, shallow rivers, and small ponds. Massachusetts also contains several islands, including the two relatively large islands of Nantucket and Martha’s Vineyard, as well as the small group of Elizabeth Islands lying between Buzzards Bay and Vineyard Sound. (Boston Harbor itself, part of the Eastern New England Upland, is also home to a handful of small islands, some of which hosted prisoners during the Civil War, and others of which have been used at times for fortification of the city). The Eastern New England Upland contains over half of the state’s population, and spreads between the northern border with New Hampshire down to the state’s southernmost border with Connecticut and Rhode Island. The state’s most fertile region, however, is the Connecticut Valley Lowland, containing most of the state’s farmland, lying between the Eastern and Western New England Upland. The only mountainous region is the Taconic Mountains, lying in the far western section of the state, where a narrow swath of mountains is found in the northwest corner. The original inhabitants of Massachusetts were Native American tribes, including the Nauset and Wampanoag Algonquin Indian tribes settled along the costal section of Massachusetts. European settlement and colonization of Massachusetts began with the arrival of the Mayflower in 1620. Europeans established a colony in Plymouth and several smaller fishing villages, including present-day Weymouth, Quincy, and Cape Ann. By 1630, the first large-scale Puritan migration from England occurred, with boats transporting approximately 900 settlers to Boston. In its initial incarnation, the Massachusetts Bay Company was governed as a private company for the first nearly half-century of its existence. The Puritans exerted a tremendous influence over the early development of the commonwealth, with many of their religious and educational influences lasting today. They established Boston Latin School in 1635 and, in the following year, Harvard University, founded with a grant from the General Court of the Massachusetts Bay Colony, both established with the idea of generating well-educated Puritan ministers. During this same time, Boston Common became the first public park in America. The period of 1684 to 1694, however, was a time of upheaval, with the Bay Colony’s charter revoked, and the political and religious unrest playing out in dramatic fashion in the Salem witchcraft trials of 1692. Massachusetts bore witness to a number of key events during the Revolutionary War, including the Boston Massacre (occurring in 1770 at the intersection of what is now State Street and Devonshire Street) and the Boston Tea Party. The famous April 19, 1775, ride of Paul Revere and the firing of the “shot heard round the world” culminated in the Battles of Lexington and Concord, both located only a few miles outside of Boston. In 1780, following the Battle of Bunker Hill and the British evacuation of the commonwealth, the Massachusetts Constitution was ratified, making it the oldest written constitution currently at use anywhere in he world, according to the secretary of the commonwealth’s Citizen Information Service. Massachusetts has again played a significant role in national politics, beginning with the election of former Massachusetts Governor Calvin Coolidge to the presidency in 1923. Former Massachusetts Senator John F. Kennedy followed in his footsteps, winning the 1960 presidential election; 1988 saw Michael Dukakis, another former Massachusetts governor, run unsuccessfully for president against George H.W. Bush. In 2004, another Massachusetts senator, John Kerry, again unsuccessfully sought the presidency. Massachusetts has also given birth to a number of notable individuals who have had a notable impact on the country in more than the pure political arena. These include not only such historical revolutionaries as Samuel Adams, Benjamin Franklin, Paul Revere, Eli Whitney and Alexander Graham Bell, but intellectuals and writers, including Jack Kerouac, Edgar Allan Poe, Sylvia Plath, Emily Dickinson and Dr. Seuss (Theodore Geisel), as well as Jay Leno, Leonard Nimoy, Conan O’Brien, and Ben Affleck. universities, including some of the more well-known: Harvard University (in Cambridge), Amherst College (in Williamstown), Boston College (in Chestnut Hill), Brandeis University (Waltham), Smith College (Northampton), and Wellesley College (Wellesley), to name but a few. The intellectual history of Massachusetts and the influence some of its more prominent citizens throughout American history have contributed to the political and liberal development of the entire United States.